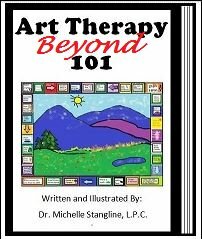 I really enjoyed this play therapy assignment for play therapist and school counselors of drawing my home and a family portrait. I have long forgotten how much I enjoy coloring and being creative. 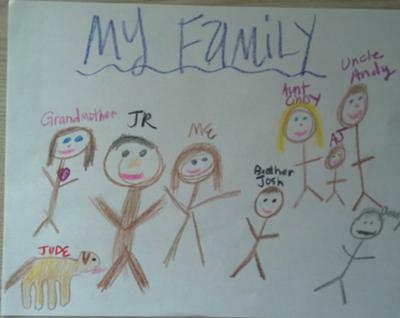 The first drawing I did was the family portrait. I am not a god artistic but took time to represent each of the members in my family. I have a small family so I have decided to add some of my extended family. First I am in the center, because it is my world. Next to me on the left is my boyfriend. He is the closest person to me and keeps me grounded. On the other side of me is my brother. While we may have our off days I believe that he will always be here for me. In the not too far distance is my aunt and uncle with their child. I love them all so much. On the other side is my grandmother. I wish there was a way to put her closer to me, because she is so very important to me. Also I have my dog. He truly is man’s best friend. Finally in the corner is my other aunt. She is drawn in gray, because we are not on speaking terms. I still included her in the photo because I love her dearly and hope that one day we can move past our differences. 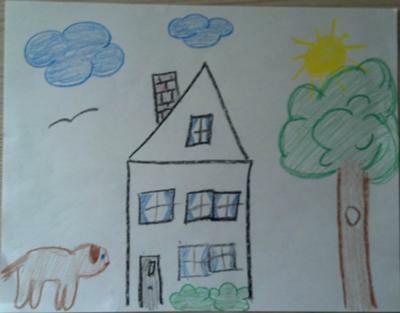 The second drawing I did was of my house. First I want to point out the windows of the home. There are several and they are decorated with blue curtains. This makes me feel my home is warm and a safe place. Next, is the tree. This is a tall healthy tree that has a spot on a bird to nest. I think of this is my relationship with my Savior. He keeps me motivated and full of life. The sun represents a father figure. I also believe being my Savior and Lord, Jesus Christ. The branches of the tree reach high aiming to please my father. There are two animals in the picture. One is my dog. He reminds me of my playful and loving side. The other is the bird soaring high in the sky. I think this represents my desire for inner peace. Also, I believe this bird represents some aspect of my mother looking down on me from heaven. If you are a school counselor or play therapist, try this on yourself first before trying it on clients or students.